Nothing fancy here but a good tasting tortilla soup. Add more hot stuff to taste if you wish. Dress it up or dress it down. I like simple myself. This recipe adapted from Cooking Light magazine. Heat olive oil in a Dutch oven over medium-high heat. Add onion and garlic; saute 2 minutes. Stir in chicken and next 10 ingredients; bring to a boil. Reduce heat, and simmer 1 hour or more. Ladle soup into bowls; top with tortilla chips and sour cream. 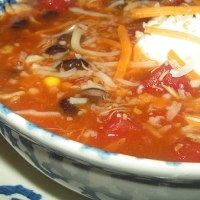 Tortilla Soup is my all-times favorite soup! although I've never had it with beans..
We have been having roast chicken quite often and I am always looking for recipes for leftover chicken. Also husband is in the mood for Mexican food this week so this might be on the list for the week. Recipe sounds delicious!